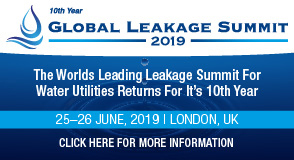 The Global Leakage Summit returns for its 10th year in June 2019 to feature the most innovative and successful examples of delivering and maintaining reduced leakage levels across the world. The speaker line-up will include experienced international water network practitioners from Brazil, France, Italy, China, Philippines, Portugal, South Africa, Turks & Caicos and the UAE, and the UK water industry is represented by: Anglian Water, Bristol Water, Northumbrian Water, Portsmouth Water, SES Water, Severn Trent Water, Southern Water, Thames Water, United Utilities and Yorkshire Water. The focus for the 2019 conference will be on using best practice policies and innovative technologies to achieve leakage targets and meet customer demand while facing political and economic challenges and ageing network infrastructure. The Global Leakage Summit 2019 will examine not only the challenges and difficulties faced by the global water industry, but also the wealth of tools and technologies becoming increasingly available to support the drive to reduce water loss.